Thalys is a consortium of the French, Belgian & Dutch national railways formed to run the high-speed trains between Paris, Brussels, Amsterdam & Cologne. German Railways was originally a minority partner, but has now pulled out. Thalys is faster than flying - Paris to Brussels in 1h25, Paris to Amsterdam in 3h20, Paris to Cologne in 3h20, city centre to city centre. Should you go Comfort 1 or Comfort 2? Thalys trains have 1st & 2nd class seats and café-bar. Thalys call 1st class Comfort 1 and 2nd class Comfort 2. Comfort 2 is perfectly fine for most people, there's absolutely no need to pay for 1st class if you don't want to. But if you don't mind the extra cost, Comfort 1 gets you more leg & elbow room and a meal or snack & drinks are served at your seat, included in the fare. Seats are arranged 2+1 across the car width instead of 2+2 as in Comfort 2, so as well as tables for 4 and twin side-by-side seats, in Comfort 1 you'll find tables for two and solo seats on one side of the aisle. A face-to-face table for two in Comfort 1 is ideal for couples. In Comfort 1 you can use the first class lounges at Amsterdam or Cologne, see the paragraph about lounges below. Seats facing forwards: Thalys trains are double-ended, with a power car & driving cab at both ends. The train could enter service either way round, so it's not possible to specify forward-facing seats on Thalys as the reservation system doesn't know which seats will face which way. But this is not a big deal on a smooth-riding train. Indeed, for a couple or a family, face-to-face seats around a table for 4 or a table for 2 are the best and most convivial option. Seat numbering plan for Thalys: . Luggage: You take your bags with you onto the train and put them on any suitable luggage rack near your seat. All luggage must be labelled with your name. Unusually, in late 2013 Thalys introduced a theoretical baggage limit of two large suitcases up to 32Kg and one smaller bag, or one suitcase up to 32Kg plus one bulky item (bike bag or skis, for example) plus one smaller bag, with prams & child buggies allowed in addition, but as no-one will measure or weigh your bags and as there is free access to the train with no-one to stop you, it's largely unenforceable and you needn't worry unless you're trying to move house by train! Politely remind staff this is a train, not a plane! Luggage arrangements on European trains. Left luggage lockers at stations. 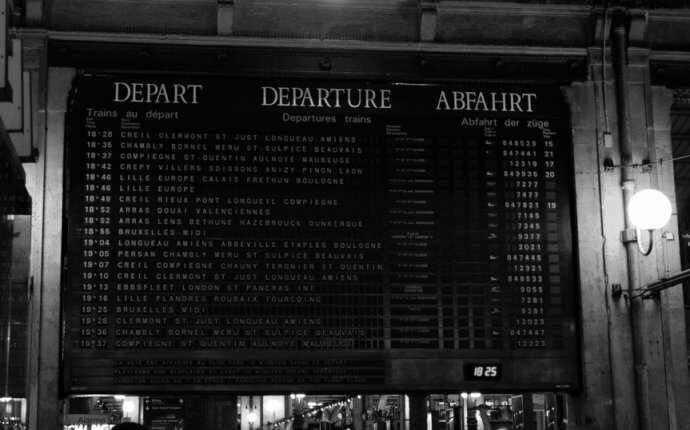 Boarding Thalys: New security measures in place at Paris & Lille: As with most European trains, there's no check-in, you just walk into the station, look at the indicator boards to find your train and get on, any time before it leaves. Doors may be closed a minute or two before departure. Since December 2015 in Paris & Lille there is a simple baggage X-ray, metal detector & passport check at the entrance to the platform. It should only take a couple of minutes, but when joining Thalys in Paris or Lille it's best to arrive at least 15-10 minutes before your train. It's largely security theatre to reassure passengers, there are no similar checks at other stations, other than a possible ID check in Brussels. Food & drink included in 1st class: Comfort 1 fares include a complimentary meal served at your seat between Paris & Brussels, or drinks & snacks served at your seat between Brussels & Amsterdam or Cologne. Power sockets: There are power sockets for laptops & mobiles (2-pin, 220v) at all seats in both Comfort 1 & Comfort 2. WiFi is available on all Thalys trains, now free of charge in both classes. Baby changing facilities are available in cars 7, 17 & 27. There are special family areas in cars 6 & 7. Children under 12 are no longer allowed to travel alone on Thalys trains.